Pregnancy is wild. Even in the moments of weakness and discomfort, there is an overarching sense of strength. I'm creating a human being. This revelation has given me a new found awe for my body and the One who created it. Although it's tempting to think that beauty is fading from me, I believe there is more beauty in this feat than in any other I've taken on. I'm thankful I was given the miracle of carrying this lovely baby and that is what I hoped to capture in these photos. We found out quickly that most greenery doesn't float for more than 5 seconds so I suggest testing several types before. Our flowers were fresh, cut off at the stems and floated well for the whole shoot. Trevor did stick close by while we shot, readjusting the flowers every few takes. 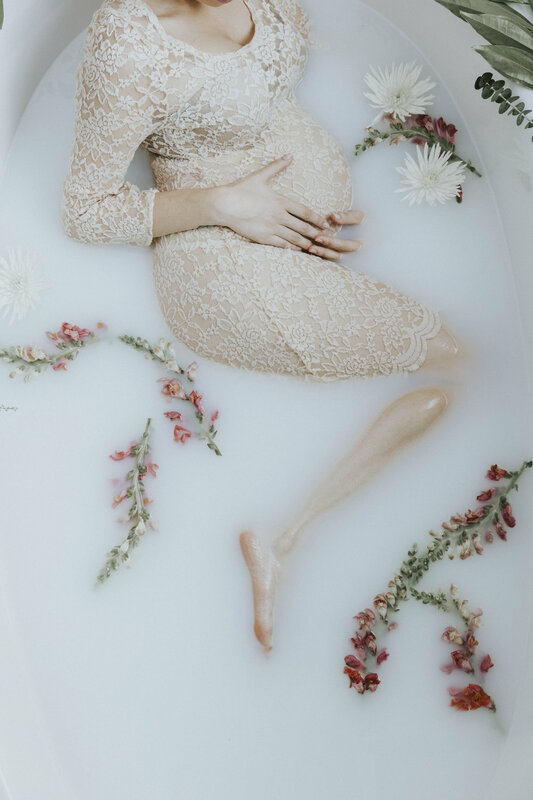 If your photographer is professional, they'll be able to help you pose in a way that doesn't look contorted (since ya know, posing in a bathtub isn't a normal occurrence). Your photographer may also want to photoshop in more flowers after the fact depending on the look you're doing for. Good luck!